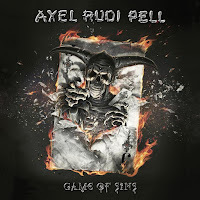 Rock & Metal 4 You: CD-Review: Axel Rudi Pell - "Game Of Sins"
Oh how time flies by. It feels like yesterday when Axel Rudi Pell's latest work "Into The Storm" was released. That was two years ago and everybody, who knows the German Axeman knows, that he is very consistent in what he is doing and so it is no wonder that the follow-up "Game Of Sins" will hit the stores on January 15th. "Into The Storm" was a huge chart success for Pell and I also felt that Axel could increase his songwriting skills from album to album in the last eight years. Let's see if "Game Of Sins" is another step forward. With Axel Rudi Pell it is always like some kind of double-edged sword and he seems to split the Metal community. The one side loves this guy for his consistency when it comes to sound and songwriting, the other side complains that every record sounds the same. The truth lies somewhere between. 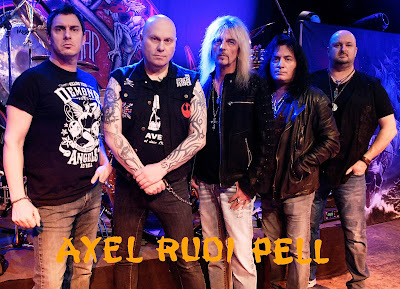 Axel Rudi Pell always delivers what his fans expect from him, so die hard fans can't go wrong and they know what they get. That's the same with "Game Of Sins". You get the epic atmosphere on the title track "Game Of Sins", the melancholic mood in "Forever Free", a mixture between heavy rockers ("Fire", "The King Of Fools") and power ballads ("Lost In Love"), very extensive and bluesy guitar solos, as well as top notch vocals by Johnny Gioeli. If you love all that stuff you'll be fine with "Game Of Sins". But I also understand the other side of the community even more than before, because "Game Of Sins" feels a bit too familiar this time around. There are many songs that seem to consist of various set-pieces from previous Pell songs (best examples: "Falling Star", "Till The Wolrd Says Goodbye", "Breaking The Rules") and to me that feels like a step back in songwriting quality. Especially the choruses are too generic and couldn't grab me like they did on the previous three records. I missed some really cool standout tracks like "Burning Chains", "Forever Angel" or "World Of Confusion". Not many melodies stuck in my head and even after various spins I just can say that the tracks sound too similiar to each other. It is nearly the same problem the new Last Autumn's Dream album has, but with one difference: Axel Rudi Pell still tries to improve things from album to album and that's precisely the case when it comes to production. "Game Of Sins" sounds huge! It is much better produced than previos records and especially the drums get more space to shine. The drumming of Bobby Rondinelli never sounded that powerful and also the rest of the band ensures a punchy in-your-face sound. With that said, even some more weaker tracks are still fun to listen to. On the other hand there are once more Johnny Gioeli's vocals that stand out here. He is still one of the best shouters out there and his voice never gets old. Combined with Pell's skills on the guitar this album still delivers solid fare for fans of epic Heavy Rock. And so everything stays the same: Axel won't gain a bigger audience with "Game Of Sins", but he also won't disapppoint his longtime fans. Personally I just can say that this isn't one of his strongest efforts, but still a solid one you can pick up and rock out to.